A few years ago a longstanding client was embarking on a new business venture. When he asked me to help him set everything up, I advised that as he and his business partner would be trading through a limited company, they should have a Shareholders’ Agreement and a bespoke set of Articles for the company. “What will that do?” he asked. “Well, the Shareholders’ Agreement will govern the relationship that you each have with the company, and with each other. The changes I make to the Model Articles you get when you set up your company will be tailored to your situation so that you know what will happen if one of you wants to leave, bring in another business partner, or refuses to attend board meetings so things can’t get done.” You won’t have to just rely on the Companies Act position – you can decide exactly how you’d like it all to work and everyone will be clear on where they stand. “Well, we’ve known each other for years, we trust each other, we wouldn’t be going into business together otherwise” he said. “Of course, I replied, but circumstances can change. It’s far better to have things written down clearly. The majority of people then generally stick to it. If they don’t it will be clear what happens.” “Oh, that won’t happen to us, we’ll just sort it out between us” “Even if you’re in disagreement about the business?” I asked. The Shareholders’ Agreement can provide a mechanism to be clear exactly what happens if you reach a deadlock situation” I say. “It’ll never happen” he assured me. However three years later he called me, slightly sheepishly, explaining that things were not so rosy with his business partner. His business partner had always intended to sell up after 3 years, it turned out – something my client had never realised. He’d pretty much left the business but was still entitled to dividends and was now threatening to sell his shares to someone my client didn’t know, or to set up in competition with my client. 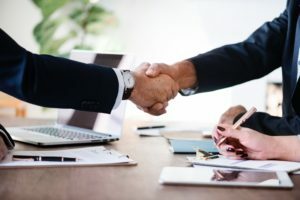 If you’re in the process of setting up a business with 1 or more people and running it through a limited company, or maybe you’re already up and running – chances are you could really benefit from having a Shareholders’ Agreement. Contact me for a free chat about your requirements.